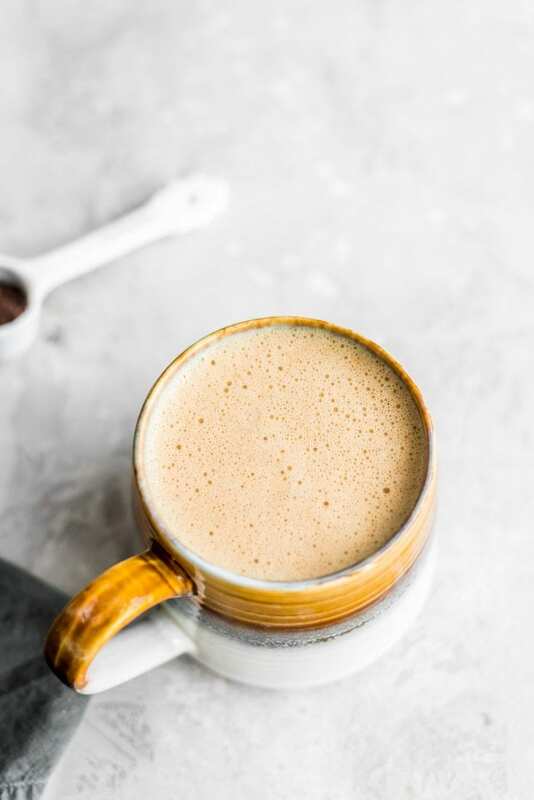 Vegan bulletproof coffee can be made with MCT oil or coconut oil instead of butter. 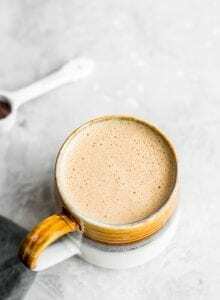 In this post, we’ll cover how to make a vegan version of the popular buttery coffee drink as well as ingredients like cashews and protein you can use to create your own delicious variations. So what’s the deal with Bulletproof Coffee anyway? Well, Dave Apsprey’s original version is made with unsalted, grass-fed butter, MCT oil and low-toxin coffee. I don’t eat butter but using just 1 tbsp of MCT oil is working great for me. Regular coconut oil works too. The original Bulletproof Coffee was meant to be used as a replacement for breakfast. I don’t use it that way. I usually drink this early morning before the gym as a pre-workout, or after the gym for cognitive enhancement and improved focus as I start working. I still eat regular meals even if I have this drink. MCT oil is medium chain triglycerides and it’s found in coconut oil as well as other foods. Supplementation with MCT oil began as a fat source to help treat disease, obesity and fat malabsorption. Recently, athletes and bodybuilders have been touting it’s fat burning and energy sustaining powers. Why add fat to coffee? The reason I like adding a bit of fat to my coffee is that the fat helps slow down the absorption of the caffeine and provides a more stable and prolonged source of energy. This helps the effects of caffeine last longer too, so you should never feel like you want a second or third cup. Drinking coffee with a bit of fat can help prevent spikes in insulin and consequent blood sugar crashes, meaning you’ll have more stable energy levels for hours after drinking it. 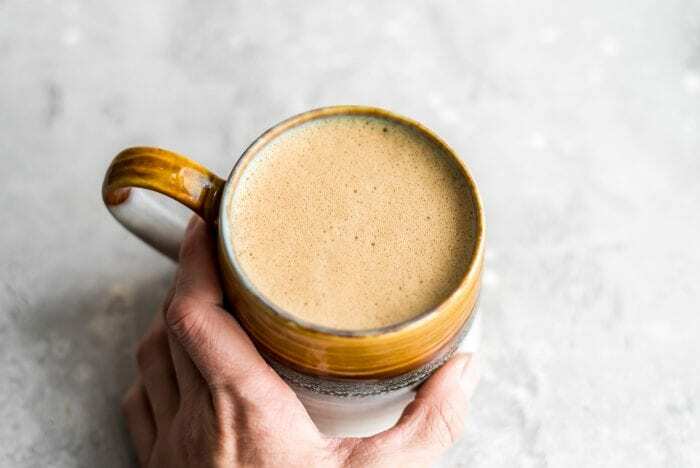 Of course, you can make bulletproof coffee with decaf coffee as well, in which case, no need to worry about a caffeine crash. Four Sigmatic Mushroom Coffee also works well and it has half the amount of caffeine as regular coffee. If you’re sensitive to caffeine, I’d recommend checking them out. I love it. Click here for more details. Coffee tends to be very acidic which can be hard on the gut and digestive system. 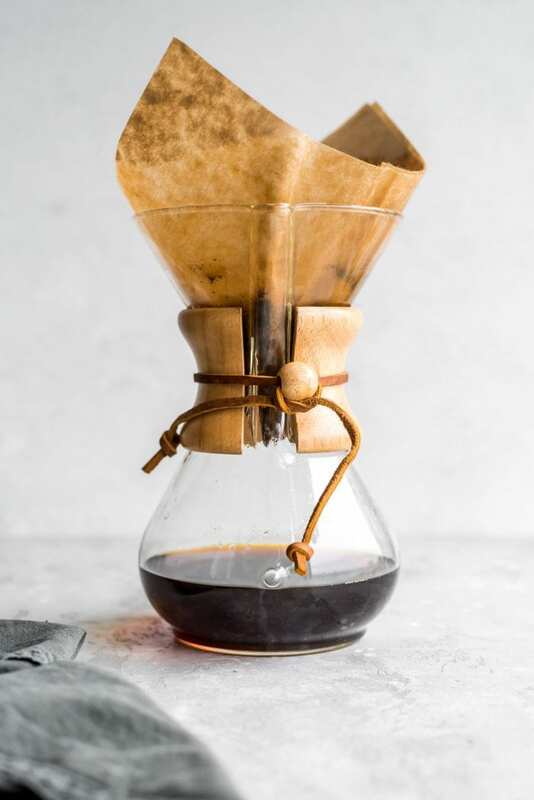 Adding fats like coconut oil, MCT oil or even full-fat coconut milk helps to neutralize the acidity in the coffee making it more digestion-friendly. MCT oil also contains CLA, or conjugated linoleic acid which is known to have anti-inflammatory properties. Brew your favourite organic coffee. I love brewing coffee in my Chemex. 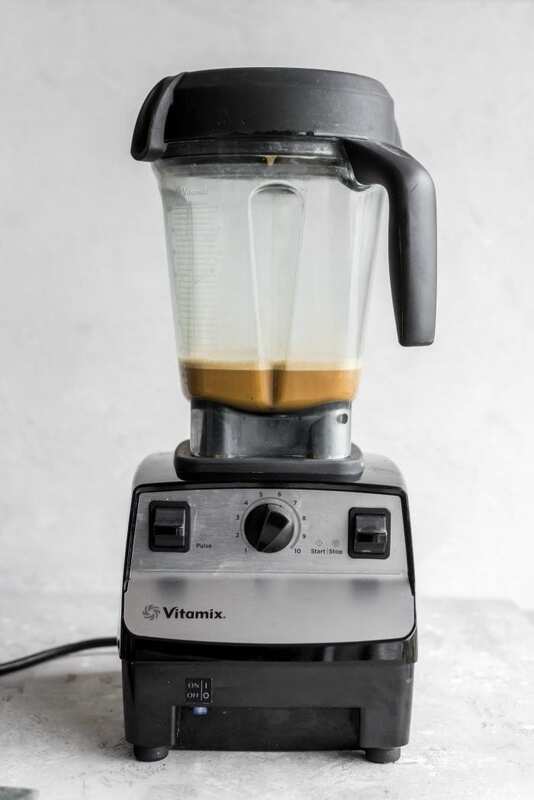 Blend about 1.5 cups of coffee with 2 tsp to 1 tbsp of MCT oil, coconut oil or coconut butter in a high-speed blender for at least 30 seconds, up to 60 seconds, until foamed and frothy. I don’t use sweetener in mine but if you like you can use a dash of maple syrup, stevia, xylitol, coconut sugar or another sweetener of choice. You can add a little sweetener if you prefer. I don’t like my coffee sweet so I just drink it as is. You can also add a little non-dairy milk if you like. Before jumping on the bulletproof coffee train, keep in mind that it is in no way a superfood, cure-all or magic fat burner. It’s simply one more way to enjoy what can be healthful foods, in a way that you love. I bulletproof coffee or matcha as a pre-workout drink or when I have a lot of work I want to get done. The caffeine provides energy and helps me focus and the fat prolongs the effects and prevents any jittery feeling. Asprey’s original recipe for Bulletproof Coffee contains a very high amount of fat and is meant to be a meal replacement. With 2 tbsp of butter plus 1 tbsp of MCT oil, you’re looking at quite a calorie-laden drink. If you have any health concerns, you may want to check with your doctor before trying it. 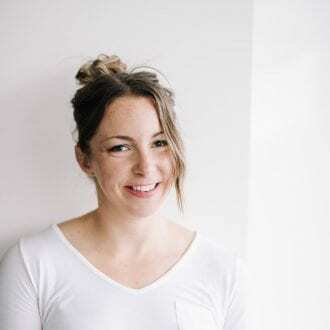 It may work for some people depending on their activity level, current diet and if they have any health issues however, I wouldn’t just jump right into that without further research. My version only contains much less fat since it only has 1 tbsp of MCT or coconut oil and I do not recommend it as a meal replacement. Do your own research, experiment and then make a decision as to whether it’s something that would be enjoyable or beneficial for you. 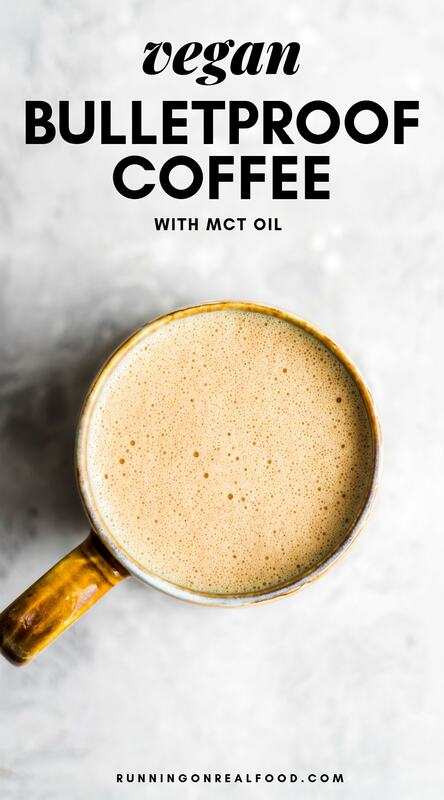 I enjoy a cup of bulletproof coffee a few times a week for the taste and improved focus and energy but I rarely drink it with just MCT oil. I usually choose one of the bulletproof coffee variations we’re going to cover below. I rarely make bulletproof coffe with just MCT oil. Here are some of my favorite variations for enjoying a little fat with your coffee. My favorites are cashew coffee and cashews or MCT oil plus vanilla protein. As an alternative to MCT or coconut oil, I love making coffee blended with raw cashews. To make cashew coffee, blend 1.5 cups of brewed coffee with 2-3 tbsp of raw cashews until smooth and frothy. Option to add 1-2 tbsp of vanilla plant-based protein powder, which is what I usually do. A pinch of sea salt is really good too. Love mocha? Instead of MCT or coconut oil, try using cacao as a source of fat. I would recommend using cacao paste for an ultra-creamy homemade mocha. You’ll need a sweetener with this one though since cacao is very bitter on its own. You can use a medjool date, raw honey, stevia, agave or maple syrup. To make a cacao mocha, use about 1.5 cups of brewed coffee and 15 grams of cacao paste then sweeten to taste. As an alternative to cacao paste, you can combine up to 1 tbsp MCT oil with 1-2 tbsp of cacao powder. Cacao butter also works as an alternative to MCT oil or coconut oil. It does have more of a distinct taste though. This is another one of my favorite ways to make bulletproof coffee. I like to do 1-2 tsp of MCT oil and up to 1/2 a scoop (15 g) of vanilla plant-based protein powder. It tastes like a vanilla latte and gives me energy for hours. I like this one before the gym in the morning. For an extra creamy latte-style bulletproof coffee, add 2-3 tbsp full-fat coconut milk. Maca is an adaptogen that may help balance mood and helps support healthy hormones. Blending it into coffee is an easy way to get it into your diet if you’re using it. Try 1 tsp blended with the MCT oil and coffee. I also like making this with matcha instead of coffee. To make bulletproof matcha, add 1.5 tsp of matcha powder to a high-speed blender with up to 1 tbsp MCT oil or coconut oil and 1.5 cups just boiled hot water. Blend on high until frothy and foamy then pour into a mug and enjoy. This is really good with some vanilla plant-based protein as well. For a caffeine-free alternative to bulletproof coffee, try my golden milk recipe made with almond milk and turmeric. 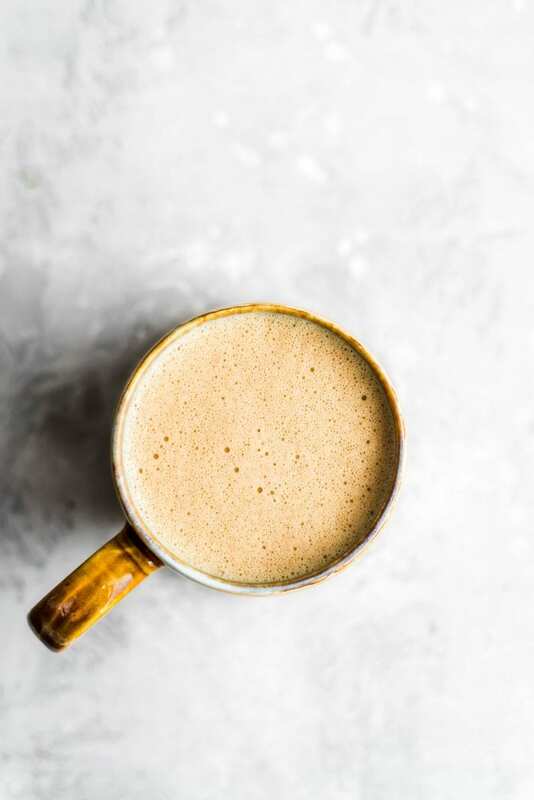 An easy, creamy latte-style drink made with coffee and MCT oil for a sustainable boost in natural energy. 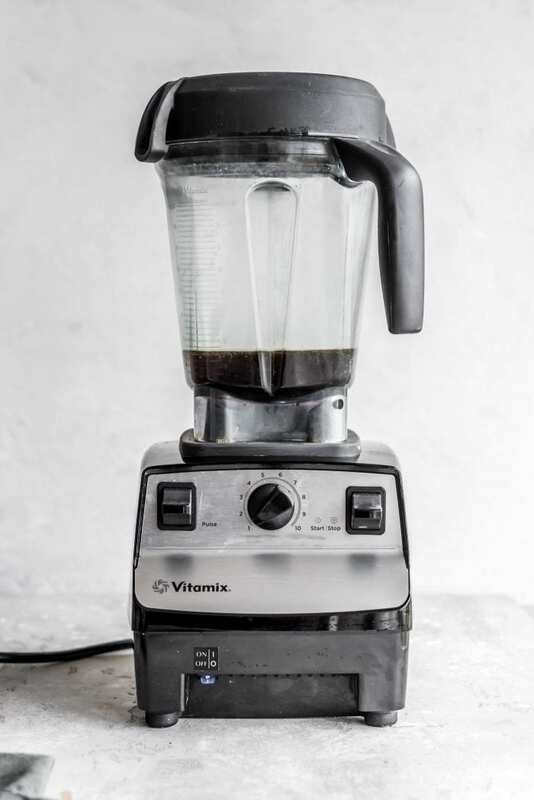 Add the hot brewed coffee and MCT oil to a high-speed blender. 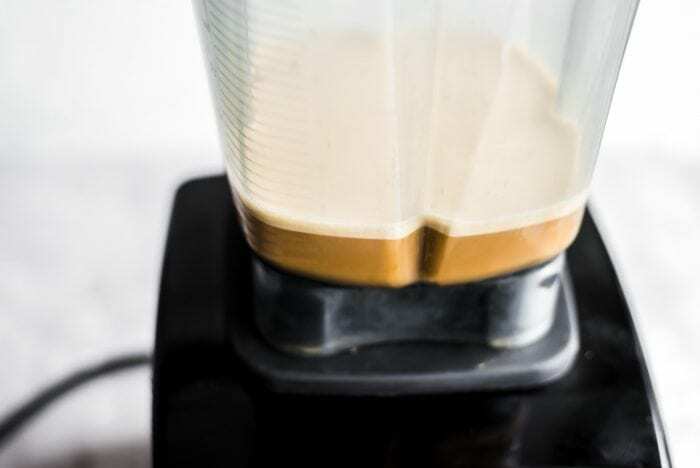 Blend on high for 30-60 seconds until a thick foam is formed on top. It should be frothy and light in color. Pour into a mug and enjoy right away. Nutrition information is for coffee plus 2 tsp of MCT oil. Adjust accordingly if you add any of the optional ingredients (stevia will not affect the calories). I didn’t know BP coffee was supposed to be a breakfast replacement. Not sure if I would feel sustained without any solid food in my belly! I may start with your version and have some after I eat and we can see. I do 1 Tbsp butter, 1/2 Tbsp MCT (sometimes i get nauseous if i put too much). Drink it on the way to work at 7:30 and don’t get hungry until around 10:30/11! Coconut oil and coffee would sound more ideal to me, but overall WOW! Wow! This looks so good! I have a few healthy recipes on my blog, so please check it out! I love Bulletproof coffee. I don’t officially use it as a meal replacement, but it definitely delays some of my meals when I have it because I get so full. I’m also not a huge coffee person, so it takes me a while to drink it which is also why I probably notice how full I get. Wow! Not a huge fan of coffee but I really want to try this out soon! I hope it somehow reduces the jittery and nervous feeling I get when drinking coffee 🙁 It’s the primary reason I opted for all-natural preworkout supplements instead! For whatever reason, it totally cuts out the jittery feeling! That’s one of the reasons I don’t use pre-workouts too, although I don’t mind the Energizer from Vega. Give this a try and let me know how you feel! A little bit of protein in there is awesome too, for energy and flavour. Looks good! I remember looking at the bulletproof stuff awhile back and while I was tempted, for some reason I felt a real “sales” vibe from the website and that always turns me away. But it’s great to hear that you are enjoying it – maybe I will check it out again. How long before workout , I workout at 3:00 PM can i still have it. It depends how sensitive to caffeine you are. Personally, I can’t drink coffee that late in the day because it would affect my sleep. Thanks for sharing this! I’m also vegan but am curious about BP coffee and was wondering if just MCT oil is enough for the benefits. I work out at 6am too… any suggestions on the most efficient way to prepare this each morning? Every minute I save the better!. I’ve also been told it should only be consumed on a low carb diet, but I’m plant based where protein sources are also often high carb, thoughts? I love that I stumbled upon this post. I’ve been looking for exactly this. Butter free and 6am pre-workout! I’m nervous that the coffee would be too dehydrating for my workout, but I guess I’ll just have to try and see. Ive been using BP coffee for a pre workout for a month now while I’m on a cutting phase. Here are my two cents so far: BP is not going to work wonders for u like Dave Asprey recalls if u are already in descent shape. Like Deryn, I drink it because it taste awesome and I don’t like doing packaged pre workouts. If u decide to drink BP coffee, you will need to make adjustments on ur diet so u don’t gain weight.